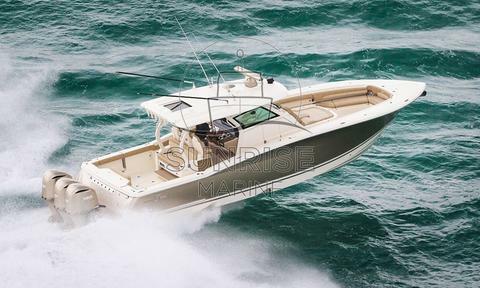 With Its EXCELLENT ITALIAN DESIGN (by such an acclaimed firm as C. Grande), this stylish fly motorboat, welcomes onboard with its large SWIM PLATFORM w/TENDER LIFT CAPACITY that EASELY ALLOWS to OPERATE any TENDER or jet skis, gathering to a COMFORTABLE COCKPIT with moulded BENCHES and CUSHIONS. Stepping inside you'll be surprised by the ultra-BRIGHT living saloon and appreciate the fully equipped lower deck galley as well as a comfortable and almost 360° view raised HELM STATION on STARBOARD. Going forward, the night area accommodates 4 guests (on top of two additional at saloon) in two double cabins, with two bathrooms, both with closed shower compartment. Modern colors and perfect matching of different materials, delivers a truly luxury atmosphere throughout. The extended FLYing-bridge, provides the second helm station, perfect for EN-PLEIN-AIRE CRUISING, a summer galley/BARBECUE cabinet and A CONVERTIBLE DINETTE to add more SUNPAD OPTION on DEMAND, ALL CONVENIENTLY PROTECTED BY A BIMINI TOP. The foredeck is reserved to the huge main sun-bath and safely accessible by the sized side decks. SESSA F40 is an IDEAL small-super-yacht, for FAMILY CRUISES, allowing extensive time on board thanks to the UNNUMBERED EXTRAS (electronics for navigation, 220V diesel generator, oversized a/c system, like-home galley just to mention a few)-SMALL HOURS ON CLOCKS-IPS DRIVES with Joystick for LOW FUEL CONSUMPTION and NO-STRESS docking, combined with keen pricing and motivated seller due to forthcoming upgrade, CALL NOW NOT TO MISS! Electronic engine control, Display, Joystick. Engine Alarm, Water pressure pump, Special Colour (Silver metallizzato), Twin Steering, Courtesy Lights, Entry door, Teak Cockpit, Shorepower connector, Water harbor connector system. Cushions, Stern Cushions, Bow Cushions, Fly Bridge Cuscions, Cockpit Cushions. ELEGANCE PACK: lacquered kitchen, corian/baths with corian top/roof leather inserts/doors wardrobe with mirror insert.